Hotel ASTOR is located in the Paris suburb of Suresnes. The Gate of Defense and the Porte de Versailles are respectively 5 and 20 minutes away by tram. Combining a rich heritage with contemporary perks, this lively European capital is a place of historic, artistic and gastronomic treasures including museums, fountains, bridges, vineyards, cafes, restaurants and much more. The City of Light marries classic artwork that can be discovered at The Louvre, or Le Musee d’Orsay, hosting masterpieces of Impressionism, with contemporary art. Here, churches are the oldest intact buildings, and stained glass windows pair up with flamboyant Gothic structures to give birth to architectural wonders, such as Sainte-Chapelle or Saint-Denis Basilica. 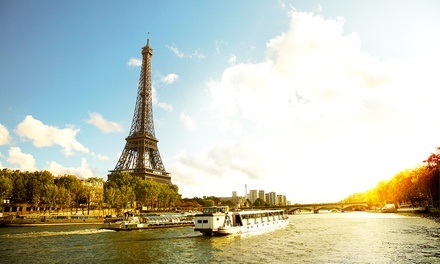 Tourists can walk on the banks of the River Seine or through the Promenade Plantée park, while Champs Elysées offers high-end boutiques, glitzy showrooms, and the famous Arc de Triomphe. Once in Paris, travellers can get a taste of the French cuisine including pastry food, sea fruits and couscous, shop in exclusive boutiques and flea markets, dance the night away in one of the many night clubs available or enjoy a French Cancan show at the Moulin Rouge. Validity: Valid from 1 Aug 2016 to 30 Apr 2017. Valid Fri-Sun, except during holidays (valid all days of the week): 1-31 Aug, 16 Oct-3 Nov, 16 Dec 2016-3 Jan 2017, 4 Feb-6 Mar, 1-30 Apr 2016. Price for 2 people. Booking: Must book at least 3 days prior to arrival. Check availability before booking.